"Finest Belleek art pottery - a Belleek porcelain jug in wonderful display condition and guaranteed genuine. 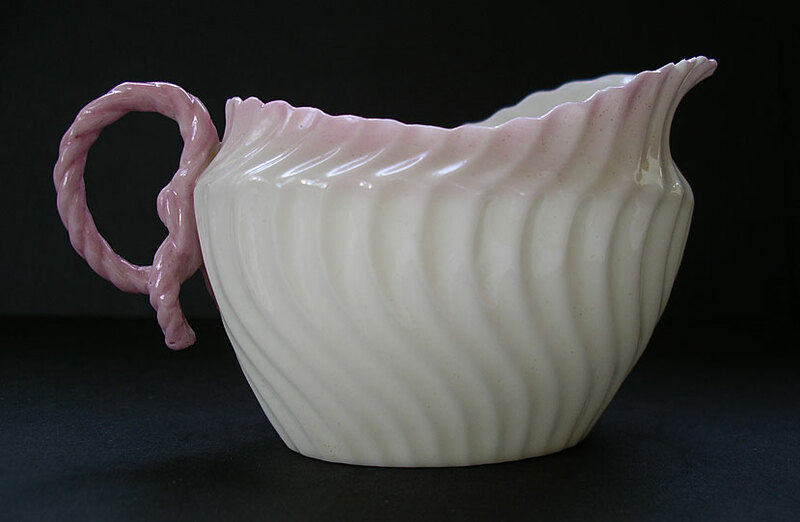 The jug is skillfully crafted in a striking and rare original design known as the Scroll pattern, highlighted in an exquisite pink colour way. Scroll pattern pieces were produced during the Second Black mark period in limited quantities and are today highly prized by Belleek collectors worldwide. 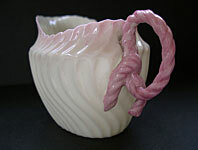 Cream jugs are among the rarest Scroll pieces of all as only one was made per tea set and the wafer thin spout, rim and intricate rope twist handle are easily damaged. A highly desirable item for the discerning collector of best antique china and Irish Belleek pottery." Antiques Expert Hamilton Bear. Dimensions: height 69 mm max. width handle to spout 110 mm max. Condition: An excellent piece in great shape for display with no restoration. 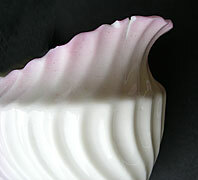 There are two small flake rim chips - to the left of the spout when viewed from the front - one is v-shaped and extends into an associated short glaze hairline as illustrated. This blends in with the design and does not significantly detract from the visual and display qualities of a rare piece. You are unlikely to find a better surviving example.